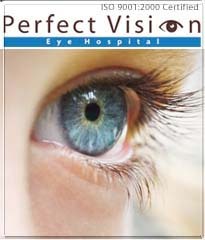 Perfect Vision Eye Hospital,Eye Hospital,Eye Institue, Perfect Vision Eye Hospital India,Eye Hopital India,Eye Institue India, Perfect Vision Eye Hospital Faridabad,Eye Hospital Faridabad,Eye Insitiue Faridabad"
Perfect Vision is a unit of Fx enterprises which is associated with the business house having a decade long association with the eye care business. The "Zyoptix center" being set up in Faridabad is the 1st of its kind in Haryana and 4th in North India. The technology being used is the latest and most advanced in the world.Bausch Lomb's Technolas® 217z excimer laser. The infrastructure and facilities would be world class and unsurpass. Perfect Vision will be Number One in the Eyes of the World. As a global eye care company, we will help consumers see, look, and feel better through innovative technology and design. We commit to providing innovative, quality products that improve vision and enhance the health and well-being of people around the world. We commit to anticipate their needs, listen to their concerns, and respond with products and services designed to build our consumer businesses. We commit to recognizing our responsibility to the communities where we work and live, to support their efforts to improve the quality of people's lives and the health of the environment we share. The result is that more and more people, including many celebrities, are choosing to undergo this highly sophisticated and very successful procedure. Because there is an increasing number of clinics offering a variety of methods to correct your vision, it helps if you have some understanding of all the options, before you make a decision. A New Frontier in Laser Eye Treatment The very latest development in laser eye treatment from Bausch and Lomb is a system called Zyoptix, a system that takes LASIK to a new frontier. Each Zyoptix assessment involves an extra diagnostic (screening) process to allow the surgeon to understand your vision more thoroughly and select the most suitable treatment for you. The Zyoptix system uses the latest, most advanced technology to detect that treat very small vision errors. The Zyoptix system has many advanced built-in safety features that help to optimise the success of your treatment. Zyoptix, like standard LASIK treatment, is fast and virtually painless. Perfect Vision India's ZyoptixTM system for Personalised vision treatments uses the latest version of the tried and tested Bausch & Lomb Technolas 217zTM laser. This laser has been specifically designed for Customised laser Eye treatments and consistently achieves a high standard of vision. The difference between ZyoptixTM and other conventional surgeries is similar to that of getting a suit stitched vs. buying a ready-made one. With ZyoptixTM, we can customise the surgery for every singly patient. The results, therefore, are much more accurate than before. Perfect Vision Eye Hospital takes pride in making available the most experienced and talented Eye Specialists and Surgeons. Our Doctors have years of Vision care and surgical experience. Medical Superintendent Medical graduate from Maulana Azad Medical Collage, New Delhi, India and post graduate from Lady Hardinge Medical College, New Delhi, India. He is an anterior segment surgeon and is specially trained in Lasik/Zyoptix surgery from Bausch and Lomb Center of Excellence, Singapore. He has special interest in cytogenetics and is trained in DNA diagnostics and karyotyping. He obtained his Ph.D in neural tube defects. He is also an excellent academician working as "Editor in chief" for a reputed publication house in India. He has edited "Advance Drug Review", a medical magazine of 1000 pages. He has numerous book publications for medical graduates and postgraduates. He is a member of editorial board of national and international medical journals. Head Squint Surgery He is a graduate and postgraduate from Maulana Azad Medical College, New Delhi, India. He was awarded gold medal for MS Ophthalmology from university of Delhi , India. He has an experience of 12 years of ophthalmic surgery and has performed a couple of thousands of Phacoemulsification surgeries and is well conversant with Lasik Surgery. He has specialized in Squint Surgery. He has been associated with prestigious ophthalmic institutions and presently is the head of department of refractive surgery and squint at Perfect Vision Eye Hospital. Sr. Consultant Eye Surgeon She is a specialist in Phacoemulsification and oculoplastic surgery. She has special interest in community ophthalmology and has worked in various community programmes with active participation in seminars and public lectures. A brilliant young ophthalmologist who has received many awards for his contribution to ophthalmology, the most significant of which is the "Chattisgarh State Government Award 2003". Graduate from Coimbature Medical College, Coimbature and postgraduate from Regional Institute and Government Ophthalmology Hospital, Chennai. He is an anterior segment surgeon with special interest in phacoemulsification and glaucoma.